Now, I've been fascinated with braided hairstyles for quite some time. (Click here to check out my love of the side braid.) But this is such a unique take on the style that I simply have to focus on it this week! I love that Kate's hair brings together two different hairstyles in such a unique way. The top of her hair is blown out into sleek, lustrous smoothness, and flows so elegantly into a simple braid that travels down her back. And rather than tying it off with a boldly hued clip or ponytail holder, there's a simple holder that matches her hair. The end result? Absolute flawless perfection. Curious about how to rock the look on your own? It's super-easy to recreate this look! Read on to find out how you can style your hair into the low braid! First off, your tresses should be sleeker than sleek. Start with a shine-enhancing shampoo -- I absolutely love Aveda Shampure Shampoo ($9.50 at aveda.com), which brings out shine like no other shampoo I've ever tried. Next, you'll want to get the shiniest blowout possible. 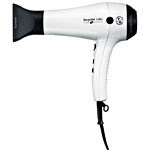 And what better hairdryer to use than the T3 Bespoke Evolution ($300 at t3micro.com)? Whether you dry with a round brush or just your fingers, this hairdryer will get the job done. Of course, blowdrying with a round brush will get your locks to glisten and gleam -- but if you're short on time, this dryer will still accomplish that in only a few minutes! Now for the fun part -- the braid! You'll want to gather your hair very loosely and split it into three wide sections. Starting at the nape of your neck, cross one section over the other -- not too tightly, or the effect will be lost. The braid should be clean and finished -- no pieces sticking out -- but at the same time, don't make it too polished or wound up! Stop braiding about an inch from the bottom of your locks. Secure the braid with an elastic that matches your hair. The Sephora Snag-Free Hair Elastics ($3.50 each for a pack of 8 elastics at sephora.com) come in three different shades -- Black, Brown and Clear -- that will perfectly match most hair colors. Finish with a shine spray that will bring out even more gleam. One like Ojon Shine & Protect Glossing Mist ($28 at sephora.com), which is formulated with wildcrafted Ojon oil and a UV inhibitor to really keep those strands glossy. And voila! An easy to create low braid that is just so simple and chic! I have an addition: Ojon Revitalizing Mist Leave-In Conditioner. Use it right before blow-drying and it reduces breakage, detangles, moisturizes and leaves hair light and strong. It is fabuloso! Erica -- Thanks for the tip! I'll have to check it out.